October was a slow month in dividend income, because I not have shares in many companies with a payment date in October. So I only received dividend from 4 companies. 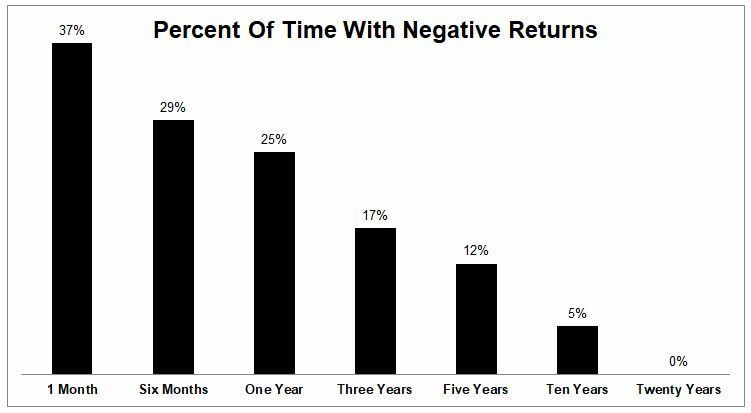 The Irrelevant Investor has an interesting read about the percentage of time with negative returns. This graph is showing that in the long run, most often, the stock market goes up and it’s profitable to go long in stocks. On the otherhand there is also a graph showing that when stocks are going down, they often go down a lot. For me as stock investor the expectation that in the long run shares are a good investment is not knew, but especially the graph showing the percentage decline in the years that stocks did go down is telling me I should think about a guideline to follow whenever stocks are for example over 30% down. Maybe this is a good time to write a long term put option or to buy a call option to cash in on lower stock exchange prices. At least at this moment it’s not urgent to think about this strategy, because the exchanges are still up. It gives me some time to do the numbers and write down some rules for myself regarding option strategies to set up after stock prices declined. Writing down a strategy in advance always makes it easier for me to do solid investing instead of doing something without exactly knowing the risks. Today Monmouth REIT declared that the quarterly dividend will be increased from $0,16 to $0,17. This results in a yearly dividend of $0,68 per year. I have 30 shares of Monmouth REIT so this dividend increase will result in $1,20 extra dividend per year. My YOC will increase from 4,35% to 4,63%.